Heresy is a central concept in the formation of Orthodox Christianity. Where does this notion come from? 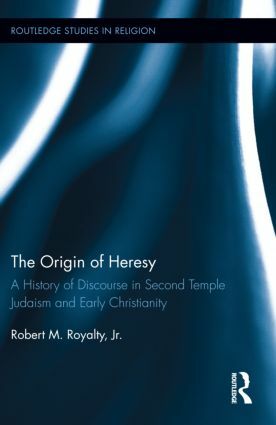 This book traces the construction of the idea of ‘heresy’ in the rhetoric of ideological disagreements in Second Temple Jewish and early Christian texts and in the development of the polemical rhetoric against ‘heretics,’ called heresiology. Here, author Robert Royalty argues, one finds the origin of what comes to be labelled ‘heresy’ in the second century. In other words, there was such as thing as ‘heresy’ in ancient Jewish and Christian discourse before it was called ‘heresy.’ And by the end of the first century, the notion of heresy was integral to the political positioning of the early orthodox Christian party within the Roman Empire and the range of other Christian communities. This book is an original contribution to the field of Early Christian studies. Recent treatments of the origins of heresy and Christian identity have focused on the second century rather than on the earlier texts including the New Testament. The book further makes a methodological contribution by blurring the line between New Testament Studies and Early Christian studies, employing ideological and post-colonial critical methods. Robert Royalty is Associate Professor of Religion at Wabash College (Indiana, USA). He is the author of The Streets of Heaven: The Ideology of Wealth in the Apocalypse of John and scholarly articles on the New Testament and early Christianity.